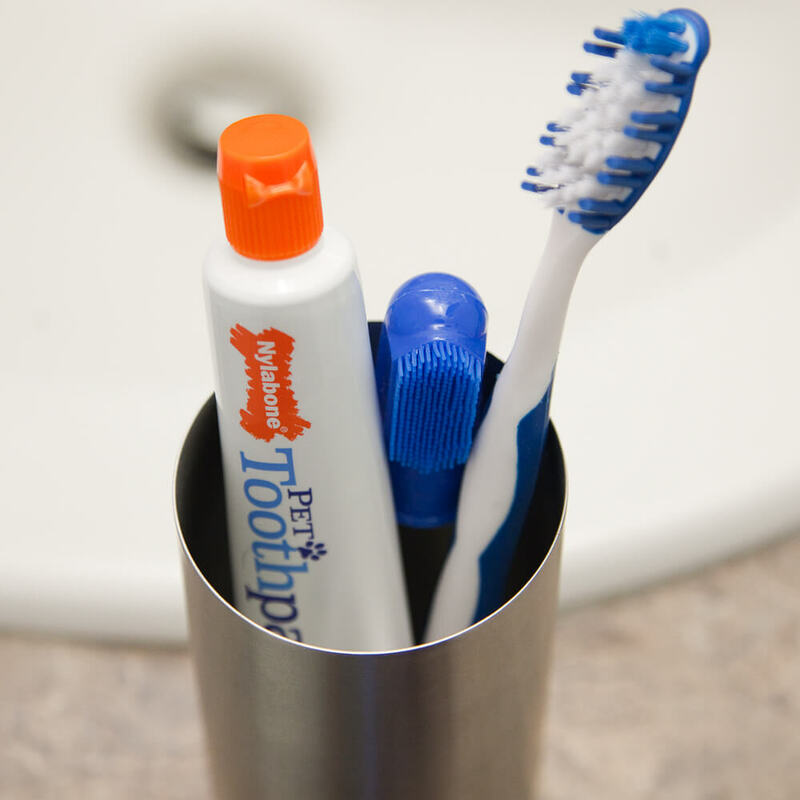 A few months ago we asked you: Do Your Brush Your Dog’s Teeth? I’ll be honest, at the time of that posting, neither Lucy or myself gave much thought to brushing Archer or Topher’s teeth. A good chew can go a long way toward maintaining good canine dental care—but, apparently, not quite enough. Last month, with Archer’s yearly checkup, the vet commented that she saw a little tartar buildup. If the vet thinks it’s worth mentioning, it’s usually something I should keep an eye on. So, off we went to pick up some supplies for brushing dogs teeth. What we ended up finding was a huge variety of products I had never even considered trying! We went for the standard toothpaste + toothbrush, but I’ll be honest… I want to try out all the products listed below, and see which on Archer prefers. Good dog dental hygiene will be achieved in this house if it means both myself and Archer won’t become frustrated by the process. Sound familiar? Check out these products we’ve rounded up, and do your pup a favour with a commitment to good oral hygiene so that adorable doggy smile will last a lifetime. Oh, and ensure you won’t have to spend an egregious amount of money on teeth cleaning with your vet, or worse: dental surgery. If your dog trusts you, and has a generally calm personality, they may take to teeth brushing fairly well. The toothpaste is meant to be ingested, so it’s just a matter of getting it on your dog’s teeth with a gentle scrub of a toothbrush. No rinsing required! It’s also designed to have an appealing taste to dogs, which is a bonus. Teeth brushing shouldn’t be chaotic—if you suddenly realize you look like a crazy person trying to hogtie an animal desperate to escape, then manual teeth brushing probably isn’t for you and your pup. This is the kit we purchased when we first started cleaning Archer’s teeth. We liked it because it came with two brushes, and we didn’t know which she would feel more comfortable with so it was nice to have a choice. It also has some great reviews from testers on Amazon, which was a bonus in our selection process. Similar to Nylabone’s kit, this one from Petrodex has two types of toothbrushes and a toothpaste included. If you’re committed to getting down and dirty with your dog’s teeth, this is equally as good an option. Don’t let the name fool you, this isn’t a toothpaste for chickens. It’s chicken flavoured. It’s also one of the highest rated toothpastes for dogs available. The only caveat? It doesn’t come with a brush. But that’s an easy fix—most customers seemed to like to pair this toothpaste with the Nylabone Advanced Oral Care Dog Finger Brush ($5). These are probably as minimally invasive as it comes with dog dental hygiene. Hold the wipe (it’s like a thick wetnap) in your hand, however you feel comfortably to get it around your dog’s teeth (typically, wrapped around your index finger) and that’s it! The only worry with this product is that it can become a choking hazard. Be careful not to let your dog take it away (some dogs really, really like the taste!) to chew or swallow, and always keep a firm grip on the wipe when you work on your dog’s teeth. Wait, maybe this is the least invasive. If you’re a fan of Burt’s Bees products (we are—Lucy loves their dog shampoo for Topher! ), you should absolutely give this one a shot. It’s a gel that you simply apply to your dog’s teeth and gums, and that’s it! I mean, I guess you could rub it in if you wanted, but it’s not necessary. Let the product do the work! Like Burt’s Bees’ Dental Gel, this product from Tropiclean is all-natural and reduces plaque and tartar buildup without the hassle of brushing. Simply apply the gel to your dog’s teeth and gums, and you’re done! You can use your finger, or a brush to get a more thorough application (and hey, they have a kitfor that! ), but it’s not necessary. Not keen on wrestling with your dog to try and brush his teeth effectively? Well, don’t worry! You have options. Combine 1 tbsp of the solution to your dog’s water (32 oz.) and mix! This had some great reviews, but a word of caution to change their water regularly. If the water sits for more than a day, it will develop a film on top as the liquid separates from the water. See if your dog likes it, but also offer an alternative water source. This makes their water a little minty (most dogs love it! ), and after about a month or so, should show great results. If your dog has a lot of tartar or stinky breath, it’s worth a try. This one is… interesting. It’s 100% dried seaweed meal, and it gets added to your dog’s food, rather than hidden in the water. The bonuses? It’s 100% natural, made in the USA (er… the seaweed is harvested north of Scandinavia, but packaged in the USA), and it has amazing reviews. The company suggests waiting 3–8 weeks to really see results. Something I’ve noticed on most of these products—they’ve been very careful with their packaging to boast a “Made in USA” mark. Which, honestly, does provide a great deal of relief to see a product made in the USA rather than China.